The Philippines, a scattered archipelago of seven thousand islands, appears to be one of the most Westernised countries in Asia. However, the realities of Filipino life are complex, and not immediately evident to the foreign visitor; the façade of the English language does not run deep. The Philippines has a unique colonial history: it was governed by Spain for over three hundred years and by the United States for fifty. The majority of Filipinos are Roman Catholics, the government is democratically elected, and freedom of speech and education are highly valued. Culture Smart! Philippines looks at the social, economic, and political issues the country faces. Despite the material disadvantages that much of the population faces, the Filipino people show an amazing resilience. They are warm, charming, and welcoming, and beyond the chaotic traffic jams and heat of Manila there is much to enjoy and appreciate. Culture Smart! Philippines also includes among its pages case studies, true stories, and advice on what to expect and how to behave in many different situations. 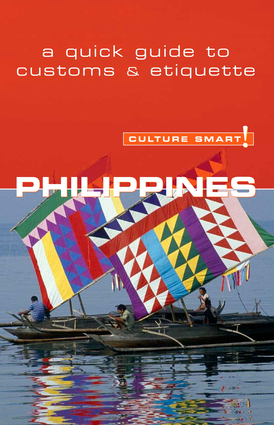 First-time visitors and long-term foreign workers will find an abundance of practical information and key insights into Filipino life that will enable them to make the very most of their time in this unique and intriguing country. Invited to a Filipino home? Don’t be punctual. The host and hostess would be aghast if their guests arrived on time - President Estrada was known for being up to two hours late for official functions!